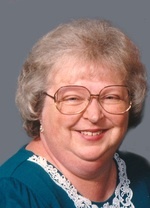 Patricia “Pat” Kay Weese, 69, of De Soto, KS passed away Sept. 4, 2016 at her home. Funeral 11:00 am Mon., Sept. 12, 2016 at De Soto Baptist Church, 8655 Church St., De Soto, KS. Burial follows at De Soto Cemetery. Visitation 10:00 am before the service at the church. In lieu of flowers, the family requests memorial contributions be made to De Soto Baptist Church for Vacation Bible School. Patricia was born Dec. 9, 1946 in Altus, OK to Jack and Cleona Elizabeth (Pyron) Calcote. She graduated from Newburg High School in Newburg, ND in 1965. Pat married Galen Lee Weese on Nov. 23, 1966 in Altus, OK. They made their home in De Soto and raised their family there. Pat was an active member of De Soto Baptist Church. She served as a Sunday School and Vacation Bible School teacher and was involved with American Baptist Women. Pat recently joined the John Hattie Possum Chapter of the DAR. She will be dearly missed by family and friends.